Statement of Concerned Scholars on the Current Predicament of the Crimean Tatars | A statement by scholars of Eastern Europe, Eurasia, and the Middle East urging all states, agencies, organizations, and individuals to support the national and human rights of the Crimean Tatars and hold the Russian authorities in illegal occupation of Crimea accountable for the violation of these rights. A statement by scholars of Eastern Europe, Eurasia, and the Middle East urging all states, agencies, organizations, and individuals to support the national and human rights of the Crimean Tatars and hold the Russian authorities in illegal occupation of Crimea accountable for the violation of these rights. The Crimean Tatars are a nation with a long and rich history going back many centuries. Because of their origins and the significance of their early modern state—the Crimean Khanate, established in the early fifteenth century—their history and culture has many connections with the histories and cultures of Eastern Europe, Eurasia, and the Middle East. We, the undersigned, are scholars whose work relates to these regions. We would like to express our concern at the situation of the Crimean Tatars since the Russian Federation’s intervention into and illegal annexation of Crimea. 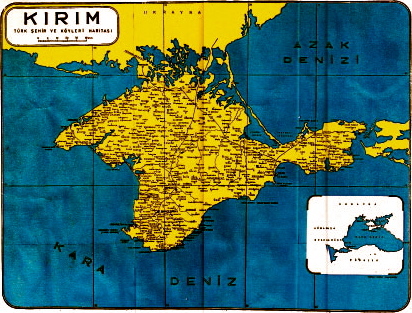 1) Unlike Russians and Ukrainians, the Crimean Tatars have no homeland other than Crimea. Ever since the Crimean Khanate was invaded and abolished by Russia in 1783, in violation of the Treaty of Kuchuk Kajnardja of 1774 in which Russia pledged to respect the khanate’s independence, the Crimean Tatars have been the object of systematic and wholesale oppression. They suffered successive waves of ethnic cleansing and subsequent forced migration to the Ottoman Empire at the hands of imperial Russia throughout the nineteenth century. On 18 May 1944 the entire Crimean Tatar nation was deported to Central Asia, the Urals, and Siberia. The mass deportation constituted an act of genocide as during and after it about half of the deportees perished from hunger, dehydration, and disease. It was only after the breakup of the USSR and attainment of Ukrainian independence in 1991 that the majority of the surviving Crimean Tatars and their descendants were able, with great effort and hardship, to return to their homeland. Today their population there is about 300,000. Because of their catastrophic history under the rule of St. Petersburg and Moscow, which has resulted in massive national trauma, the vast majority of Crimean Tatars are loyal to Ukraine and remain adamant in their opposition to the Russian annexation of Crimea. 2) The Russian annexation of Crimea in 2014 was achieved through a covert military operation under cover of which a coup occurred on 27 February, installing a new local government in Simferopol and declaring a referendum that was at first concerned with increased autonomy, and a few days later, secession of Crimea from Ukraine and accession to Russia. This was done contrary to the Constitution of Ukraine and that of the Autonomous Republic of Crimea, and without even a clear option to vote for the status quo, as one option was to join Russia and the other virtual independence from Ukraine. The referendum was held contrary to all norms for referenda of this importance—such as the possibility for free public discussion of the ramifications of a vote to secede. Moreover, instead of monitoring certified by internationally recognized agencies, it was carried out under the watchful eyes of masked Russian troops and armed local “self-defense” vigilantes. The result, an official 83% turnout and 97% vote to join Russia, was clearly falsified, as virtually the entire Tatar population and much of the Ukrainian and Russian population boycotted the vote. There is considerable evidence that the turnout was no more than 30-50% and that only half of those who actually turned out voted for secession. A survey made by two respected polling companies just prior to the Russian intervention indicated that at most 41% of the Crimean population would opt for joining Russia. In any event, since the vote was carried out without strict adherence to accepted norms, it is impossible to determine what the true turnout and result was. The actual annexation of Crimea by Russia a few days after the illegal referendum of 16 March was in violation of numerous treaties and agreements, and of international law. 3) The Crimean Tatar national assembly, the Qurultay, and its representative-executive body, the Mejlis, have reaffirmed the will of their people to remain in Ukraine and categorically condemn the Russian takeover. The Crimean Tatar population is currently under huge pressure to accept Russian citizenship—refusal can mean loss of work, pension, access to schooling, and other social benefits. In addition to their fundamental distrust of Russia, which is today widely recognized to be an authoritarian state, the Crimean Tatars are at risk of a decline in basic freedoms and increased violations of their human rights. They are fearful that should they continue to reject the new regime they could face mass repression and even the violence and trauma of another mass deportation. These concerns have been expressed in a recent resolution from the Parliamentary Assembly of the Council of Europe (PACE). In the first days of May the human rights situation of the Crimean Tatars deteriorated drastically. The Russian authorities banned their leader, Mustafa Jemilev, from entering Crimea for five years and declared protests against this ban to be extremist acts while heavily fining participants. The chief prosecutor in Crimea officially warned the head of the Mejlis, Refat Chubarov, that it will be “liquidated and banned” should it continue to organize “extremist” activities. The Russian authorities prohibited the commemoration of the 70th anniversary of the deportation of the Crimean Tatar nation on 18 May 2014. For the past 22 years 30-35 thousand Crimean Tatars and others would gather on this date in the central square of the Crimean capital of Simferopol to mourn the deported and the dead. This time tens of thousands of paramilitary police were brought into Simferopol to prevent this traditional gathering in the center of the city. Attack helicopters hovered overhead to drown out and intimidate gatherings that were held on the outskirts of Simferopol and in Bakhchysarai. Searches were carried out in the homes of prominent Crimean Tatar activists and Mejlis head Chubarov was threatened with criminal prosecution. 4) The international community has condemned the seizure of Crimea and does not recognize the legality of its annexation (United Nations General Assembly Resolution 68/262, 27 March 2014 and Parliamentary Assembly of the Council of Europe, Resolution 1988, 9 April 2014). demand the full rehabilitation and restoration of the rights of the Crimean Tatars and provision of aid for the return of those who still remain in exile in former Soviet territories, including restitution of their property and compensation for their national trauma. We, the undersigned, urge all states, agencies, organizations, and individuals to join us in our support for the national and human rights of the Crimean Tatars—including their cultural, social, political, and economic rights—and to hold the Russian authorities in illegal occupation of Crimea accountable for the violation of these rights.